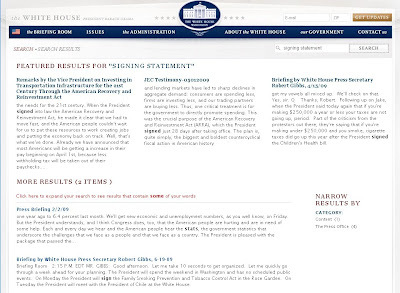 When my Facebook friend Peter M. Shane first pleaded with the Obama administration to "Keep Signing Statements Rare," I was surprised at the revelation that the new president was engaging in this practice, given his background as a professor of Constitutional Law and his public pronouncements in support of the balance of powers. 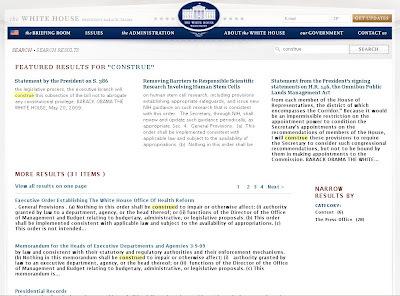 During the Bush administration, these statements were tucked out of sight on the White House website, and it took familiarity with the peculiar verbiage of Executive Branch legalese to find them using the site's search engine. As I explain in "Word Search," the word "construe" could be used to flag the Bush signing statements, which were otherwise not locatable in a single location.